Please e-mail us at [email protected] to take part. Please let us know if you would be happy to open your garden on the day ! Some people might like to open for just 2 hours so that they can visit other gardens. It’s a great way to get to know your neighbours and make new friends on the estate, see how they enjoy their garden, their favourite plants, and take inspiration ! Contact [email protected] if you’d like to be part of the planning committee or have any suggestions. 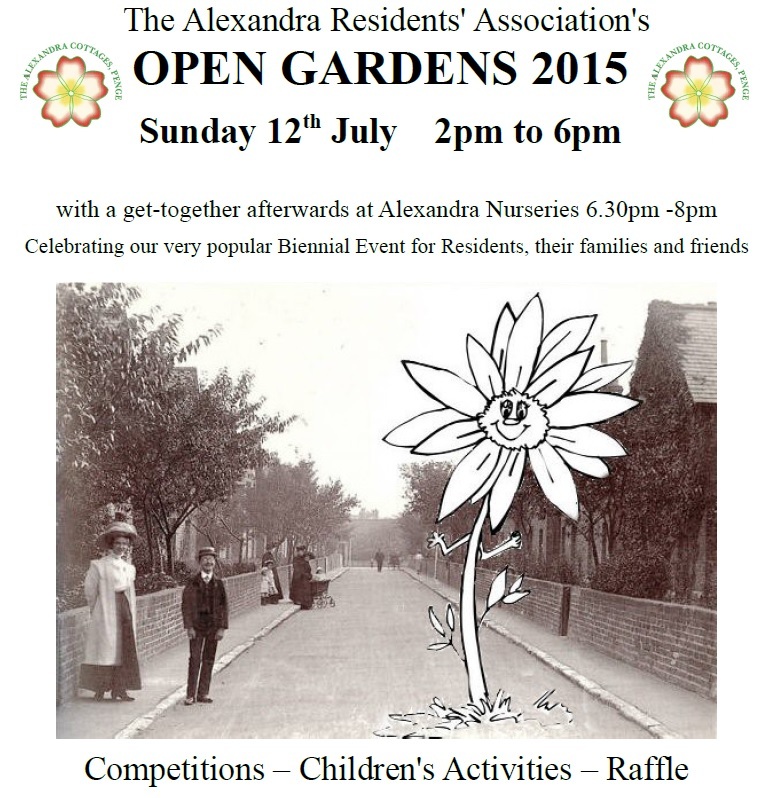 See http://www.alexandracottages.co.uk/events/open-gardens for previous years. Your road representative, or a member of the committee, will be calling on you during the next few weeks to check if you would like to open your garden and sell you tickets for the afternoon. Check the ARA website www.alexandracottages.co.uk or join https://www.facebook.com/groups/alexandracottagesfor updates on what’s going on. 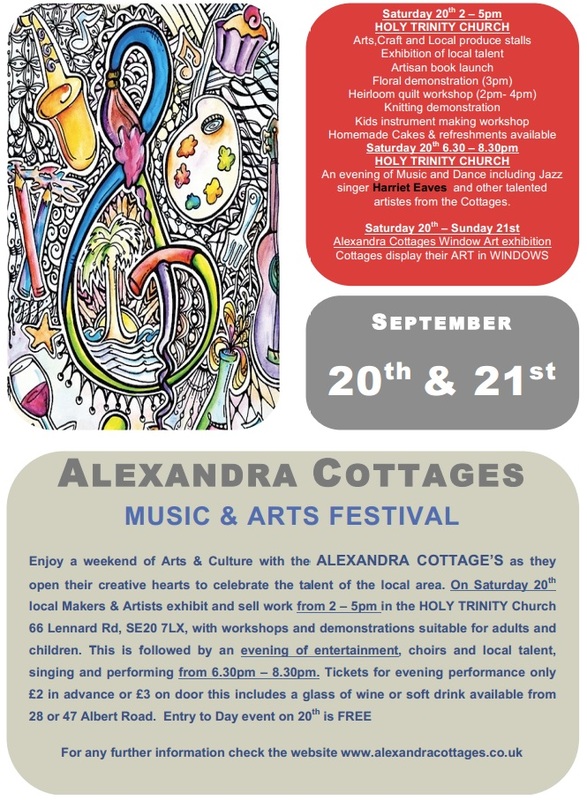 The Alexandra Residents’ Association’s Art and Music festival was a great success. (please note that the first video is not available on mobile devices, due to a copyright issue with a couple of music tracks). A big thank you to everyone who bought tickets in the raffle for the knitted animals. The winning numbers for the raffle were: 71, 110, 111, & 155. 155 is the only one unclaimed. Please contact Shirley to claim your prize. 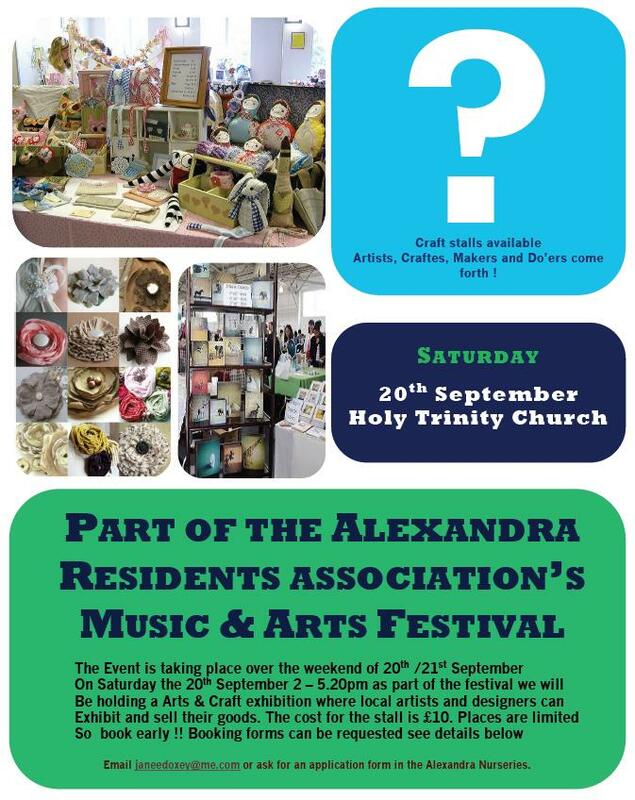 Following a really enjoyable Art, Craft and Music Festival last week-end, the Alexandra Residents Association would like to take this opportunity to thank all of those that supported this event and helped to make it such a success.. This includes stallholders and workshop leaders during the daytime events, as well as those that volunteered to spend all day ‘in the kitchen’ serving the multitude of wonderful homemade cakes and refreshments that so many residents kindly donated. Thanks have also been sent to all the talented members of our local community who performed at the evening concert,and made it such a great evening of entertainment for all those that attended. Thank you also to the members of our wider community in Penge who supported us by either advertising the festival, or attending any of the events. When embarking on the planning of such a festival it is never certain how it will be received or supported. Once again it was reinforced to all of us involved, that we are so lucky to live on the Alexandra Estate,where neighbours and friends ‘pull out all the stops’ to retain and enhance the feelings of a vibrant and friendly community and to promote all that is good about living in Penge. 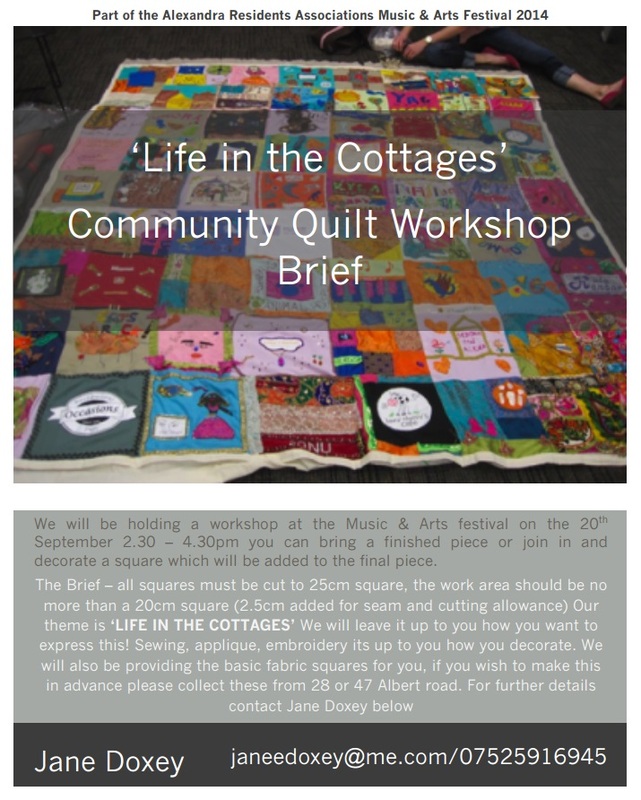 Please click here or on the picture above to view the full programme of events. Please find below the minutes of our 2014 AGM, and another 2 documents that were presented at the meeting. You can download/open each of these documents by clicking on their titles. [email protected] or ask for one at the Alexandra Nurseries. Our AGM will be on Tuesday 24th June at 8pm at the Crooked Billet on Penge Lane/Penge High Street. 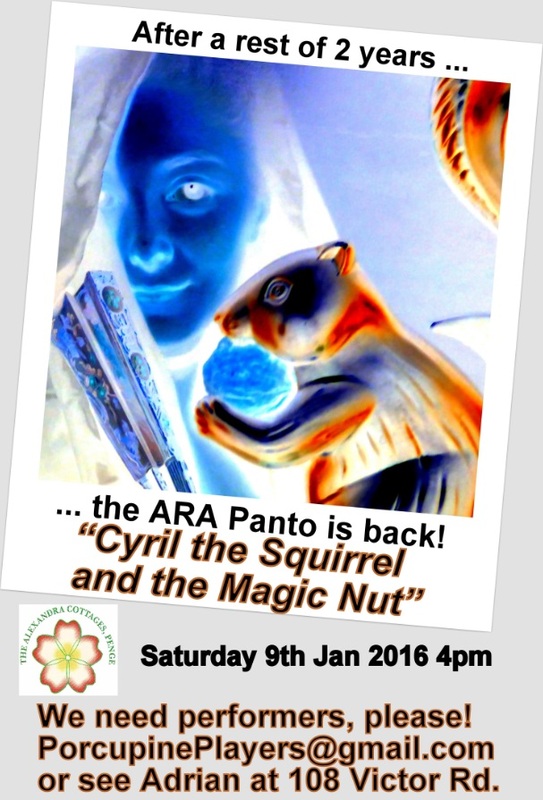 Please put the date in your diary! All welcome and we are seeking election of new committee members and looking for new road reps in Princes and Victor Roads. Please do consider being more active as the more people we have the lighter the load for everyone and the more fun and sociable things are!